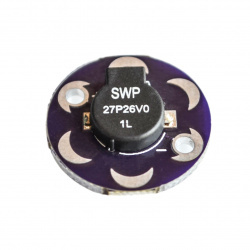 If you want to add beeps, tones or alerts to your Raspberry Pi project, you require a Piezo Buzzer! 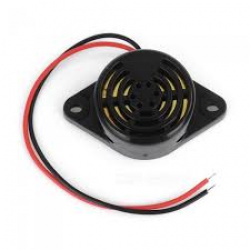 This mini transducer is small but loud, and can be driven with a 1-20V peak-to-peak square wave. To use, connect one pin to ground (either one) and the other pin to a square wave out from a timer or microcontroller. For the loudest tones, stay around 4 KHz. For extra loudness, you can connect both pins to a microcontroller and swap which pin is high or low ('differential drive') for double the volume. This one plops perfectly into a breadboard and has short legs, so can also easily be mounted on a PCB! Please Note. This item is externally driven, e.g. requires a microcontroller to produce a tone. 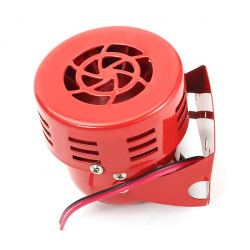 A true high quality, Heavy Duty, All Metal Air Raid Siren Horn. 3 inch Diameter and features a rugged construction, easy mounting. 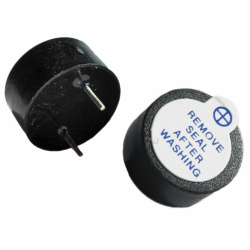 Applications Vehicle: Fits on Any 12 Volt Vehicle, such as Car, Truck, SUV, Motorcycle, Yacht, Boat,Vehicle, Bus,etc. All metal body, durable use. This is a small buzzer for the LilyPad system. Use 2 I/O pins on the LilyPad main board and create different noises based on the different frequency of I/O toggling. Loud enough to hear inside a pocket but not obtrusively loud. Please note: This is an inductive buzzer meaning that is will act as a short to ground if you are not actively driving it. We recommend you put both I/O pins to low (0V) when the buzzer is not used. Also, it's come to our attention that washing these buzzers will damage them. Until we've figured out a solution to this, avoid washing any portion of your project that contains one of these buzzers.